Understanding Suicide shines a light on the problem of suicide in our society. 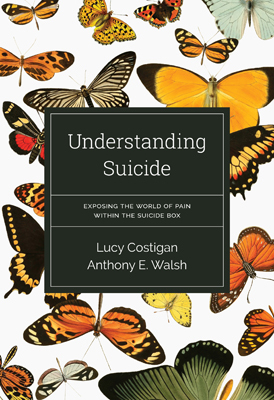 Analysing the social factors that enable and facilitate suicide, such as education, religion, the media, politics and the law, this book highlights suicide as a product of society’s structures. Looking to society, rather than the individual, for both cause and solution. Understanding Suicide presents a new perspective on solving the problem of suicide. Society’s structures foster unfairness and inequality and render some individual characteristics, skills and abilities more favourable than others. This results in the marginalisation of those who cannot effectively contribute to society’s structured needs. Personal accounts of people affected by suicide underline how external forces influence the direction of lives, and take suicide out of the realm of personal choice. Positive change requires a seismic shift involving changed attitudes, bottom-up community approaches and an acknowledgement of the unnecessary pain that society causes. We have a choice. If we remain as we are, then we must learn to live with suicide as a feature of our society. If, however, we accept and change the deadly, socially determined journey that carries some of our beautiful citizens to suicide, we can bring notable change to those suffering overwhelming pain. Anthony E. Walsh is a retired member of the Irish Prison Service, where he focused on staff welfare and prisoner rehabilitation. He studies suicide issues, working closely with families bereaved by suicide. He holds an honours degree in Psychology, a BA in social Studies, as well as qualifications in suicide studies, therapeutic group facilitation and counselling. He is also Managing Director of NM Proactive Solutions Ltd., a training and education company that develops proactive social programmes for schools, businesses and organisations.